Have you been thinking of ways to liven up the landscaping of your yard? Consider having Allmaster Home Services install a beautiful new retaining wall at your home. We’ve been serving residents of Upper Marlboro and nearby areas since 1987, installing countless retaining walls for many satisfied homeowners. We stand apart from other home improvement companies because we offer unique, specialized services and never pressure you into making a purchase. Customer satisfaction is our number one priority, and as a testament to this, we’ve earned an A+ rating with the Better Business Bureau. When you first contact Allmaster about wanting a retaining wall installed, we’ll come to your home for a complimentary consultation. We’ll start by examining the area where you’d like to have the wall placed and listening to any concerns or specific requests you may have. Then we’ll provide you with a presentation and design of what the finished product will look like. Once you give us the green light, we will schedule an installation time that is most convenient for you. When it’s time for the installation of your retaining wall, you can trust that the project will be completed by our team of experienced and trained craftsmen. Additionally, we back our work and products with warranties, so you can rest assured your investment is protected. 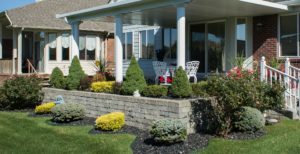 To learn more about our retaining wall installations for homeowners in Upper Marlboro and neighboring Maryland communities, contact Allmaster Home Services today.